Thanks for the kind review. I’m blushing! Better bookmarks and a double handful of item illustrations are coming in the next update! Thank you for the comment, Randall! And excellent job regarding this gem of a tome and the continuous product support!! 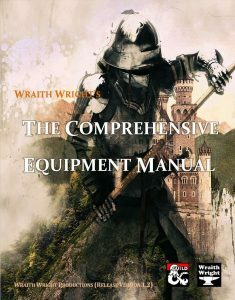 You should really update this review now that the manual is revised and almost double the content and double as good! Thanks for the comment, Matrix Scorcia! I have a ton of reviews on my plate and since I’ve already sung the praises of the book to the highest heavens, updating the review right now isn’t my highest priority. If a patreon asks for a prioritized revisit, I’ll gladly comply, but right now, I have other books I need to cover. I have understanding for your prioritisation. I’d say that when you go back and consider your selections for Ton Ten of 2017, you should consider this book on the revised version.